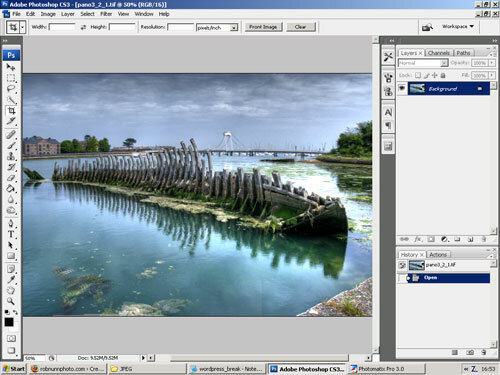 robnunnphoto.com - Posts / Home - HDR Panoramas Using Photoshop CS3 and Photomatix - Two Methods! 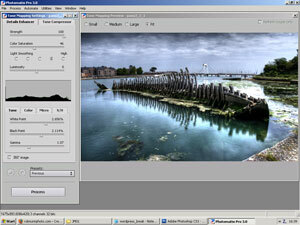 HDR Panoramas Using Photoshop CS3 and Photomatix - Two Methods! I like Panoramas, and Photoshop CS3 (or Elements) are very, very good at stitching them together. You can take handheld Pano's, and the results will be superb. The next step is the use of High Dynamic Range images for really dramatic Pano's - so here's how to do it! The old saying "garbage in, garbage out" applies to Panoramas - so we need to put in a bit of thought before we take any shots at all. For the best results we want to be using a tripod, with the camera in the portrait orientation, and putting our camera into manual mode to avoid it automatically changing the exposure as we look at different areas of the scene. If you're new to HDR, try to take lots of normal pictures (with different exposures) to get used to the technique before going Pano. So, look at your subject, and decide on the composition. Think about the darkest and brightest areas of the whole panorama and think which areas are going to set the exposure. This is generally the brightest part, so go to manual mode, use spot or average photometry depending on what looks best, then dial in your settings (take a few test shots). Swing your camera around on the tripod, checking that the horizon doesn't skew as you turn, and you're happy with the composition. Turn on auto exposure bracketing (if your camera has it), then point your camera at the start point. Take a picture of your hand, so you know that this is the start. Now take your first set of photos. If bracketing is being used, great, but if you've got to change the exposure yourself, do it by changing the shutter speed - you don't want to change the aperture because that will effect the Depth of Field (what's in focus) of the image. I generally use 3 exposures, -1ev, 0ev and +1ev, but for really dramatic shots (with less noise) you can go even further, it just becomes a bit time consuming. Its now time to swing the camera round to take the next shot. We want to be overlapping one third of each image, so pick a point in the viewfinder that is roughly at that point, and gently turn the camera, and shoot again. Repeat until you get to the end, then take a picture of your hand so that you'll know where the end is when you transfer the pics to your PC. That should be it as far as capturing the images go - but if someone walked across the shot, the wind got up, or the light changed, you'll have to do it again. If you're taking pictures of landscapes with clouds bear in mind that clouds move deceptively quickly - so speed is of the essence if you want everything to look cool at the end of the process. Take some different compositions, angles and exposure settings. Don't go too mad and do ten or 15 shot wide pano's - they're difficult to get right, and perspective distortions creep in, so stick to Panoramas that are about 5 or 6 normal images wide. Now we're back at home, we're going to start processing. There's two methods I've used, each works better on different images, so that if you process one HDR Pano and it comes out wrong, then try the other. 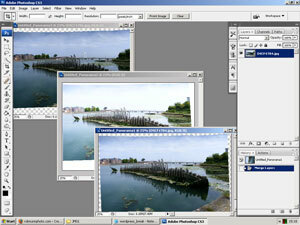 The first method is to use Photoshop first, then Photomatix. 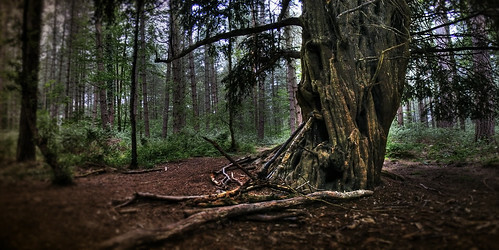 The second (and my favourite) is to use Photomatix first, then Photoshop. We use the two different programs because each has its own strengths. Photoshop CS3 is great for creating the Panoramas, but the Photomatix Pro Stand-Alone Software is much better for the HDR creation and Tone Mapping (better than the plug-in too.) Lets Go! If you've got an old PC like I'm using at the moment, you don't want to be working on full resolution images, they'll take too long to render, so if I'm going to be displaying these images mainly on the web, I'll get Photoshop to batch re-size them first. It makes everything much faster, but degrades the final image quality. If you're going to be printing the Panoramas out, work on full-size images. First up, isolate the images you're going to be using in their own folder to avoid confusion, create an empty folded called something like "pano images small versions" then fire up Photoshop. 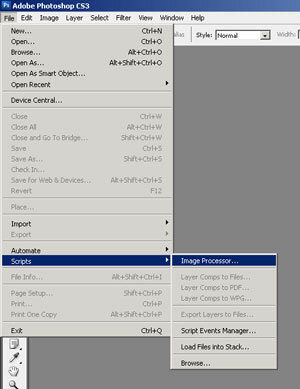 Click "File", "scripts", "image processor". You'll then get the dialogue box up, select the folder with the original files, then tell Photoshop where you want the smaller versions. Save as .jpg, quality 10, then you need to tick the re-size to fit box. I'm going to make my images 2/3rds smaller. The originals are 3072 x 2304, so I'm going to re size them to 1024 x 768. This is quite extreme, but my PC is very slow! (PII 512mb......). Hit "Run". Lets get on with the first method. I'm going to be using Photoshop CS3 to create 3 Panoramas, all at different exposures, and we're going to get Photoshop to align them, then we'll crop them to make sure they're all the same size (vital for Photomatix to work!). The dialogue will appear. Click the "Auto" mode, then browse and select the first set of images for your first panorama - make sure you get the matching exposures! An easy way to do this is to resize the file explorer box so that only three thumbnails can fit on the screen (if you taken 3 exposures for each scene), then just work your way down, ctrl clicking each one to import them all in, then run Photomerge. Now we've got our first Pano, rotate it (don't crop! ), then merge all the layers together to make the file size smaller. 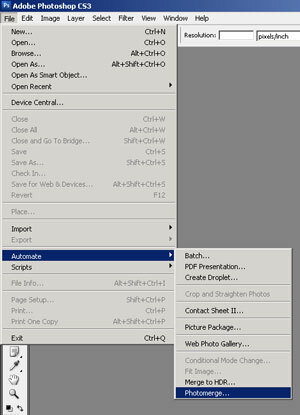 Save the picture as a PSD (in case of crashes), then minimise it and run Photomerge again on the next image. Repeat until you have three pano's of the same scene, all at different exposures. Now we've got three panos, all exposed slightly differently, but they'll all be slightly different in terms of size and maybe some of the stitching too, so we need to get Photoshop to align the layers for us. We'll do it by copying them so they're all in the same image, but in different layers, then we'll use the "Edit", "Auto-Align Layers" function. We have to do this to help Photomatix blend them later, but more importantly we can then also crop them so they're the same dimensions. So, use the move tool and the alt key to drag the images into the same picture. Ctrl-click on all the layers, then press "Edit", "Auto-Align Layers". If you click the eye icons on and off in the layers palette you should now see that all the layers are aligned. You could use the clone tool and / or the spot healing tool here to iron out any small differences, but remember that Photomatix is very good at this too! It's normally things like ropes, wires, or thin objects that cause trouble - which can be avoided by using a tripod (and a windless day) in the first place. If your pic needs straightening now's a good time to do it. I use a new guide as my reference - "view", "new guide", "horizontal" or "vertical", then drag that guide up against something that should be straight, then rotate the image. Remember that you almost always get some distortion when doing Panos, but I don't worry about it too much. When we've got the final Tone-Mapped image from Photomatix we can always use the distort tool or lens correction to sort things out. What I'm going to do is now crop the image to make all the layers the same size. Now we want to save the individual layers in their own .jpgs, you do this by only having the eye-icon active in the layers palette for the layer you want to save, then "file", "save as". Use the highest quality setting and name the file something like pano1_underexposed. Repeat for the other layers, naming them "overexposed", "justright", etc. Now fire up Photomatix Pro, then hit "Generate HDR" and browse to, and select, our 3 images. You may well get this warning screen appear, but I just say OK. You'll then get the dialogue box. My settings are: Align source images by matching features, allow crop, attempt to reducing ghosting artifacts such as background movements, take tone curve. Obviously if there's moving objects in your Pano's you'll want to use different settings. Your HDR image will appear, then hit "Tone Mapping". Now we can see our Tone-Mapped HDR Panorama! This is probably the point where you'll see any errors in the process - strangely distorted areas or blurring, and if so you could try method 2. If all looks OK, have a quick look at the Tone Compressor Tab to see if that's any good, and if not return to the details enhancer and start playing around with the settings. When you're happy, hit "Process" then save the file as a 16 bit Tiff. 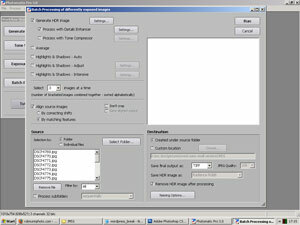 For this method we're going to process all the images in Photomatix Pro first. The problem with this is that we can't see the whole HDR / Tone Mapping effect on all of the image - we have to choose the main part, do our editing on that, save those settings, then use "batch processing" to do all the work automatically. 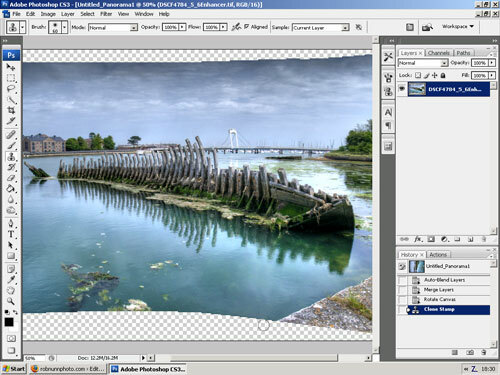 As you can see, I've opened up the main part of the wreck (three images) and used Photomatix and its Details Enhancer to create the look I want. Now I have to click "Presets", "Save Settings", to store my preferences. I can now close this image without further steps. Right, this bit is a kinda complicated. 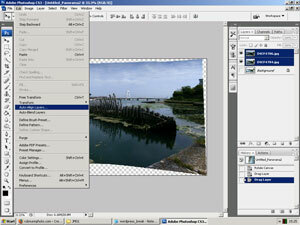 Back at the main Photomatix screen, click "Batch Processing". Now we need to work through the settings. Tick "Generate HDR Image" and click "Settings". "Force Exposure Values Spacing" to (usually 1ev), but only if "Exposure Value Not Found In Exif Data" . Tick "Attempt to Reduce Ghosting Artefacts", with either moving objects and background movements. 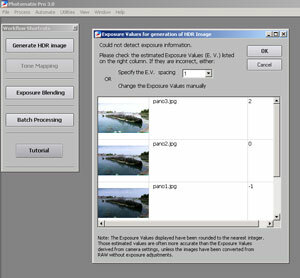 Tick "Process With Details Enhancer", click settings, change the "output depth" to 16bits, and in the presets, select your previously saved setting. Leave "Select 3 Images At A Time" as it is, or change it if you're doing more exposure values. Tick "Align Source Images", "By Matching Features", and allow cropping. Now select your source folder, then define your output folder, I use "Created Under Source Folder". "Save Final Output as a Tiff". Once its finished, simply open up Photoshop and use "File", "Automate", "Photomerge", and select the files Photomatix has created. 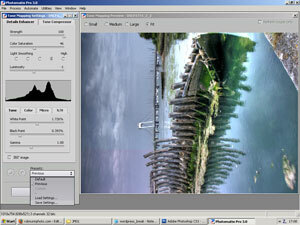 Once Photoshop is done, you can then merge the layers, crop, rotate, and work on the image. Done! 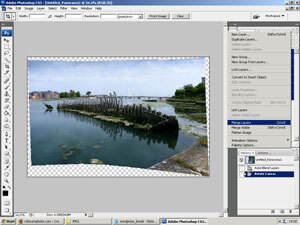 So, two methods for making HDR Panoramas. I like the second version because it seems to make less mistakes, and you're retaining file quality throughout the process (less changing to .jpg's), but if one doesn't work, you've got another technique. Try both, and have fun with HDR Panoramas! Are you able to adjust image (white balance, sharpness, curves, etc. in the finished pano? Just did some practice ones, but I can't edit anything. Just click on the options drop-down menu in the layers pallette and "merge visible" to create a single layer, which you can then work on as normal.